Extend Your Reach – To Asia! India: The vast diversity of people groups, geography, and religion makes this nation of 1.3 billion people an almost overwhelming challenge for the church. The rise of a more aggressive Hindu movement has added new obstacles to the spread of the gospel. But God wants each one to know Him and His word and WMP distributors are not deterred. To assist in this monumental task WMP is sending container shipments of literature with all the major languages of India as well as many of the regional languages. A container with 2.1 million booklets will cost $84,300. You can reach 5,000 precious souls with a donation of $200. You Can Help! 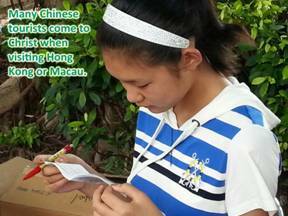 China, via Hong Kong and Macau: Hong Kong and Macau are major tourist destinations for a growing number of Chinese. Recent estimates are that 30 million mainland Chinese per year visit theses two destinations! This presents a wonderful opportunity to share the gospel with them while they are visiting outside mainland China. A WMP partner ministry provides tourist bags with souvenirs, maps, and other items, including WMP Scripture booklets in Chinese. 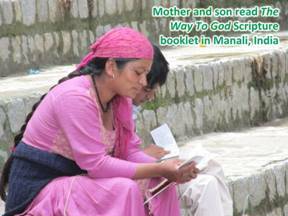 They share one-on-one conversations about the one true God and Jesus Christ His Son and find many receptive. WMP is preparing 20′ containers of almost 1 million items each for Hong Kong and Macau. A donation of $5,000 will provide 125,000 WMP booklets to help reach Chinese who may have no other opportunity to hear of God’s love for them. You Can Help! 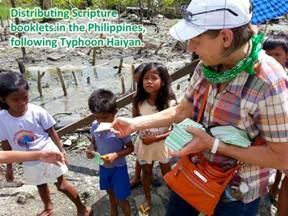 The Philippines: For more than 30 years WMP literature has been faithfully distributed throughout the 700 inhabited islands of the Philippines. Churches, ministries, and evangelists look to WMP for tools to reach the 93 million people and reap a harvest for the kingdom. A major WMP partner has recently requested a separate shipment of 1.4 million booklets to go home to home in the coming year. To supply this ministry and the hundreds of other distributors in Philippines WMP will be preparing two 40′ containers with a total of 3.5 million booklets at a cost of $161,300. A donation of $5 will reach 125 homes. You Can Help! Indonesia: Indonesia has the largest Muslim population in the world. While the law allows religious freedom, Christians often are restricted or even attacked. The work of evangelism goes on steadily and quietly as believers share the gospel wherever and whenever they can. Requests for the WMP salvation coloring books continue to grow as this effective and well received book is shared in schools. WMP can provide 50,000 copies in Indonesian at a cost of $10,275. 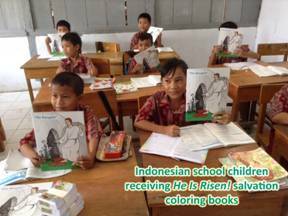 Your donation – whether $10 or $10,000 – will help carry the gospel across the islands of Indonesia, reaching children and families. You Can Help!